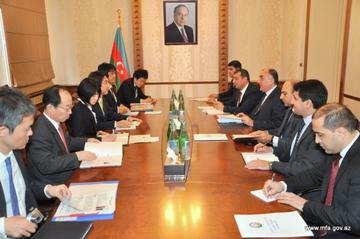 Azerbaijan`s Foreign Minister Elmar Mammadyarov has met a delegation led by Japanese deputy Foreign Minister Minoru Kiuchi. Minister Elmar Mammadyarov hailed political, economic and energy cooperation between Azerbaijan and Japan, and stressed the importance of the activity of intergovernmental commission on cooperation and reciprocal visits in terms of the development of bilateral ties, AzerTag reports. Minoru Kiuchi noted that Azerbaijan’s contributions to the regional peace and stability, energy security and fight against radicalism are highly appreciated by Japan. At the meeting, as a continuation of successful bilateral cooperation in the energy sector, non-energy cooperation, particularly in the fields of industry, agriculture, high-technologies, science and education and humanitarian spheres was discussed. Highlighting the negotiation process towards the peaceful resolution of the Armenia-Azerbaijan Nagorno-Karabakh conflict, Elmar Mammadyarov added that the UN Security Council resolutions with regards to the conflict demand immediate, unconditional and complete withdrawal of occupying forces from the occupied territories of Azerbaijan and return of Azerbaijani refuges and internally displaced persons to their homes. Furthermore, adding that Armenia does not fulfill the demands of the UN Security Council resolutions, he underlined that the international law reaffirmed the principles of territorial integrity, sovereignty and inviolability of internationally recognized borders of states. They also exchanged views on cooperation within international organizations, as well as regional and international issues of mutual concern.